Just because you’re opting for a three-row luxury crossover SUV to accommodate your family doesn’t mean you have to compromise on high-tech features. Take the 2017 Acura MDX as a prime example of this. Its technology offerings are wide ranging, which means you can expect features that are as fun as they are practical. Peruse some of the 2017 Acura MDX technology features available to you when you shop at Acura of Ocean. Your navigation system will always be a step ahead when you tack the Technology Package onto your MDX, thanks to traffic updates and rerouting, as well as detailed maps. AcuraLink allows you to remain connected in various ways while on the go, with access to your data and messages as well as concierge services and weather updates. Change songs, place a call, and adjust your climate settings all with the sound of your voice. You’ll never have to take your hands from the wheel. All information you could possibly need will be displayed clearly in your MDX when you install the color multi-information display, which boasts up to an 8-inch screen. Acura goes big on technology, there’s no doubt about it, and the 2017 Acura MDX is no exception. Whether you go with the base model or add a package to enhance your luxury crossover even further, the 2017 Acura MDX technology is certainly worth your attention. In addition to the aforementioned high-tech features, the 2017 Acura MDX has much more in store, including two different rear-seat entertainment systems, safety programs like the Blind Spot Information System, and high-quality sound from the ELS Studio Premium Audio System. 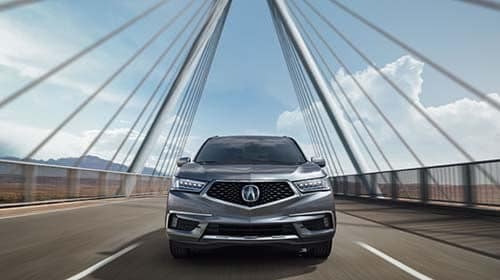 However you decide to technologically outfit your MDX, you can rest assured that the options are available to you at Acura of Ocean. Browse our inventory and contact our team once you’re ready to get started!